On Tuesday, my officer election ballot arrived in the mail, and yesterday I received the special election issue of The Peg-Board. Many of you will be getting the same mailings very soon (your mileage may vary, according to your distance from downtown L. A. and North Hollywood.) This year, there are fifteen members running for eleven positions on our Executive Board. The mailing's return address is that of the American Arbitration Association, which handles our elections. When you open it you'll find a ballot, a white envelope and a yellow envelope. Take the ballot and mark it with an X in the box next to your election choices for the Executive Board. Do not vote for more than eleven candidates. You do not have to mark any of the officer positions which are uncontested. Do not make any other marks of any kind on the ballot. Put the ballot into the white envelope, seal it, put the white envelope into the yellow envelope and seal the yellow envelope. You'll notice your name and address on a label on the back of the yellow envelope. Do not remove this label or cross out your identifying information, or your ballot will be ruled ineligible. This is in line with Dept. 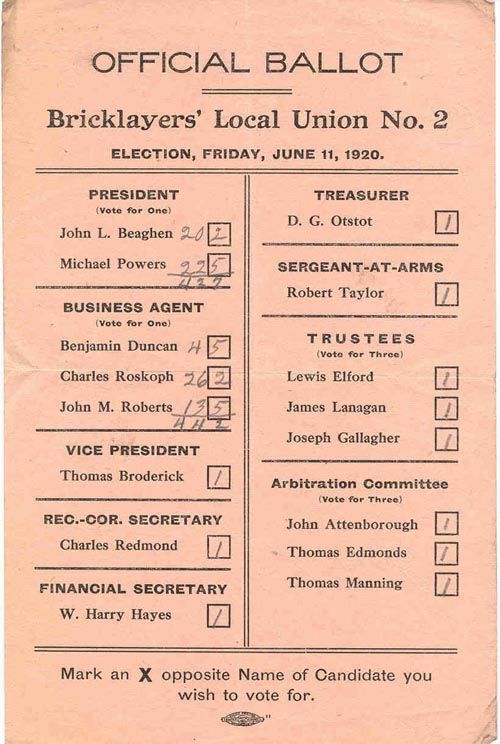 of Labor procedures for union officer elections. Ballots have been mailed to all active and applying members, but only those who have paid their fourth quarter dues by November 8 will have their ballots counted. On November 9, the AAA will take the yellow ballots, eliminate any duplicates and those who have not paid their fourth quarter 2013 dues, and then open the remaining white envelopes before they start the count. Put the prepaid yellow envelope in the mail, and you'll have done your duty to your Guild.